What’s the best way to carry a disgustingly large amount of money to the club? Probably a bank card, it’s easy, convenient, and fits nicely in your wallet. Not for Floyd Mayweather though, oh no, Floyd thinks bank cards are for pussies – real men carry their cash wrapped in huge stacks in their arms, because YOLO. The retired boxer was spotted with the aforementioned fat stacks at the King of Diamonds club in Miami, where according to The Mirror magnum bottles of Ciroc vodka go for $600 (just under £400). 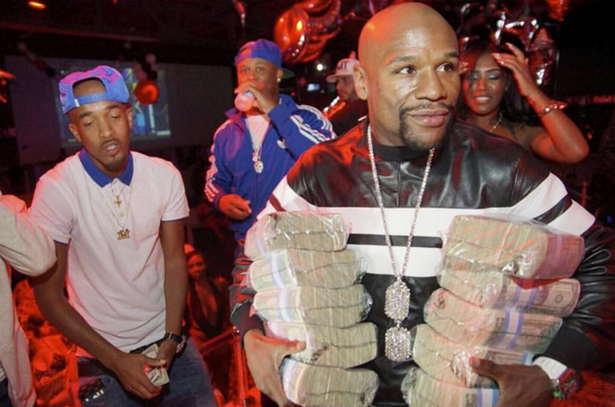 Floyd and his pals can be seen in this set of images throwing money at strippers and pointing at the camera with large piles of dollar bills in their hands. You know, just a standard Tuesday night down the club.